The first of a series of three posts by Clive Parkinson, Director of Arts for Health at Manchester Metropolitan University, based on his February 16 Seminar. Presenting my ideas to colleagues at Durham’s Centre for Medical Humanities was always going to be a little daunting, because the work they’re undertaking and the journey of exploration they’re on, is as considered and robust as this arts/health conversation has taken us. So I was thrilled to talk with a packed room of people, and with standing room only for late arrivals. For aesthetic purposes, you must imagine I had a wind-up gramophone and when I played the sumptuous Black, Brown and Beige (the blues), by Duke Ellington, that it wasn’t from my mobile phone, but the lights were dimmed and Joya Sherril sung personally for those present, and as Ellington hoped, you listened to those words as a ‘tone parallel to the history’ of Black America. My recording, in fact, was from 1943, just 13 years after Billie Holiday sang Strange Fruit about the lynching of two young black men; Thomas Shipp and Abram Smith. Yet the record I played, had been included in a compilation album called, Symposium in Blues, produced by the pharmaceutical giant Merk, and distributed to tens of thousands of general practitioners in the USA in1966 as a sophisticated marketing campaign for their new anti-depressant Elavil. It seems ironic that whilst mental health units and prisons were overcrowded with large numbers of African Americans, that an album of predominantly black musicians was being used to sell an anti-depressant. And thinking about the precarious state of our economy and the depressing cuts being made across society right now, I thought the music might just relax us a little, but judging by the recent demonstrations in France and Greece, and now the unrest spreading across Northern Africa, it seems we in the UK are perhaps already a little too relaxed! Or might buttoned up and retentive be more appropriate? Why aren’t we taking to the streets in outrage at the crisis we’ve been plunged into? Ok, so our leaders might not be unopposed despots, but we are currently experiencing huge changes to the fabric of our society, dressed up as cost-cutting, but more likely the outcome of a long-term vision; and of course, the actions of an unelected coalition government. But I’m getting ahead of myself. 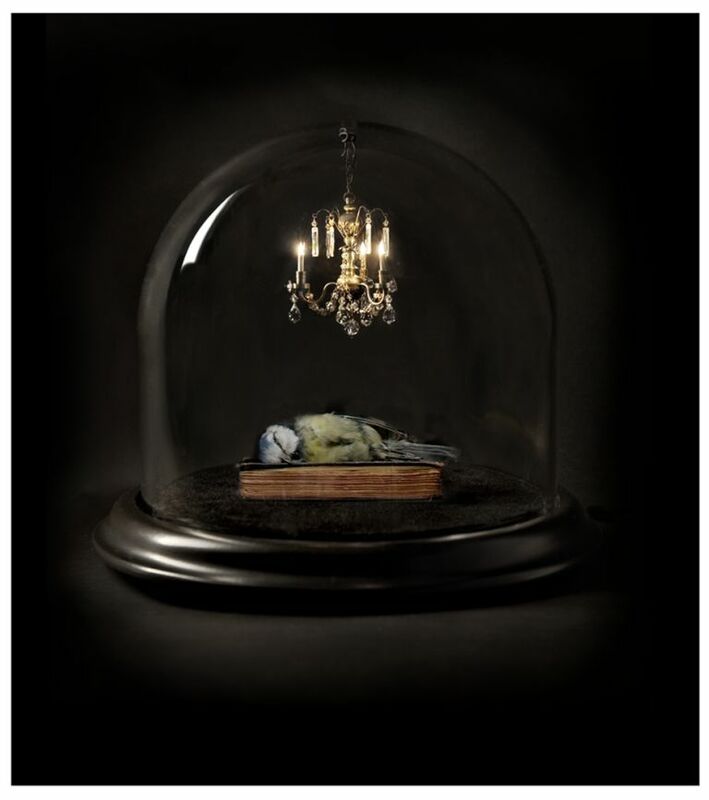 In my presentation, I shared a personal story with you; but with no names mentioned, I felt comfortable to tell you of the frustration I felt after an emerging artist, Polly Morgan, had kindly offered her work as a stimulus within an NHS mental health unit…only to be rejected by the Chief Executive Officer, who considered the little stuffed bird in a bell-jar, ‘totally unacceptable,’ and ‘not art.’ My solution to such censorship was to withdraw from the contract, but that experience in 2006, set me off thinking who exactly is art for, and does art in clinical settings just have to be pretty little trinkets and gloss? With considered sensitivity, can’t we share more challenging work? What I wanted to do at this event, was share some ideas about our global depression in both senses of the word. Looking at our on-going global recession and the global phenomenon of depression, which the Word Health Organisation (WHO) tells us, will be the biggest health burden on society both economically and sociologically within 20 years. Exploring ways that I believe that these WHO figures reflect the pathways that have led to the global downturn, and the way we perceive depression in our pursuit of well-being, with the inspiration from film-maker Adam Curtis’, The Trap, I plotted a narrative from the work of economist John Forbes Nash Jr, (made famous by Russell Crow in the film Beautiful Mind) through the development of Game Theory (reductivism and selfish-individualism) and its influence on psychiatry and ultimately target culture, consumerism and the pathologising of everyday sorrows. Through R.D Laing I portrayed a paranoid vision of the family, which reflected how Game Theorists saw society and which is still evident in our target culture. In the 1970’s the idea of surveying and analysing the state of peoples mental health in the USA had really taken off, and by the end of that decade interviewers across the states had surveyed hundreds of 1000’s of people to get a picture of the population. The results were astounding, with more than 50% of the American public surveyed, according to this new numerical analysis, suffering with some kind of anxiety, stress, phobia or depression. And the rise in new categories of disorder that were emerging all the time, took hold of public consciousness in the USA. I suggested that if the public was beginning to self-monitor, (if they had this diagnosis), it was only a matter of time before they would want help to make themselves ‘normal’. An easy conclusion to draw from the data was there was a hidden epidemic. In a country like America where the pursuit of happiness is a constitutional dream, the unequivocal scientific fact, that the computer says you have a diagnostic label, begs the question, am I not happy enough, because I am sick? To the pharmaceutical industry, this was a golden opportunity, to chemically fix societies imbalances. In 1988 Prozac was introduced and by 2005, 27 million Americans were taking antidepressants, (that’s 10 percent of the population), and at an annual cost of ten billion dollars. And in a society that places value on science over other forms of knowledge and materialism and the free market over other ideologies, it’s very easy to be taken in by this market-driven zeitgeist. This pathologising of unhappiness and dissatisfaction as some kind of disease, Greenberg suggests, puts at stake our very essence; of what it is to be human.